Amanda and Warne are STRONGER. 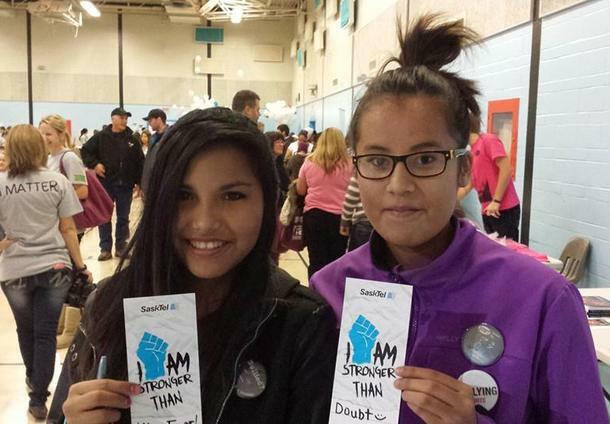 These two visionaries were the hearts and minds behind the Bully Free Battlefords event that happened Sunday at the Don Ross Center in North Battleford, and they had to be inspired with how their vision turned out. I Am Stronger was there to witness the event, and you could feel the positive energy in the gymnasium- from the bands blasting out the tunes to the speakers (including I Am Stronger supporters Unkle Adams and Sgt. Brian Trainor), there was lots to see and do. Since the death of Todd Loik nearly two months ago, the Battlefords community and Amanda and Warne took the amazing initiative to do something that could help make a difference. But they did way more than that- they brought a sense of healing to the community and helped start to influence social change so that something like this never happens in their hood again. I Am Stronger was proud to be a part of the event, being there to share our message and support the community.